This book has it all! Martial arts, wondrous mystic martial art powers, Chi channeling, Chi powers, Chi weapons, magic items, and special abilities and powers that will blow your mind! Plus, great warriors, demon hunters and their tricks of the trade, blind mystics, fortune tellers, Spirit Hosts (half-man and half-animal spirit), Enlightened Demons (as player characters), and heroes, powers and special abilities galore. For you high-tech junkies there are wonders from Geofront, with things like Demon Skin body armor, the Gun Dragon, Black Tiger power armor, high-powered weapons, select vehicles, the Demon Eater, Assault Geo-Borgs and the incomparable Gun Master. Rifts® China One set the stage, presented the nefarious Yama Kings and their demonic henchmen. 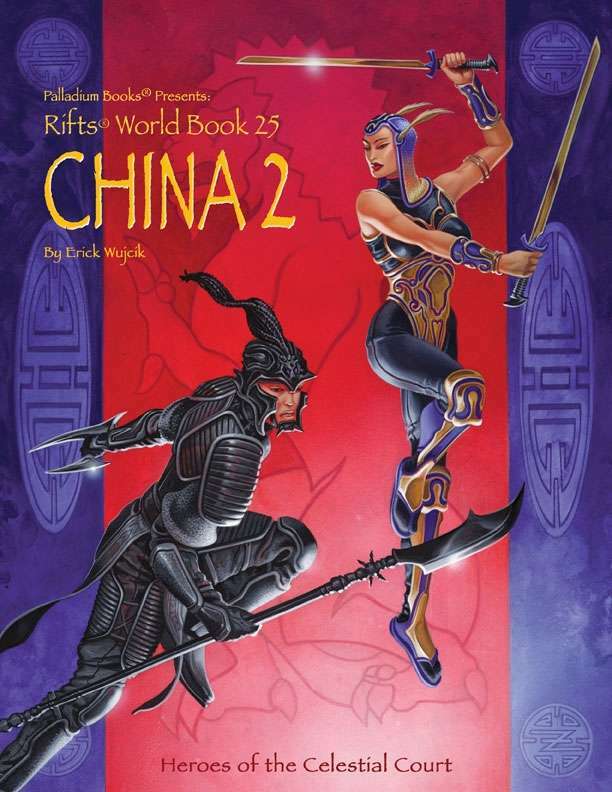 Rifts® China Two presents the heroes out to stop them. Rifts China’s Greatest Heroes – Celestial Warriors, Fighting Monks, Soothsayers, the Great Demon Catching Hero, Goblin Wrangler, Blind Mystic, Spirit Host, Gun Master, Enlightened Demon and more. Many with special powers and abilities in addition to Martial Arts. Geofront weapons, power armor, gear and Military O.C.C.s; including the Gun Master. Written by Erick Wujcik. Additional text and ideas by Siembieda, Gleba and Yoho. 160 pages full of one incredible idea, power or character after another.